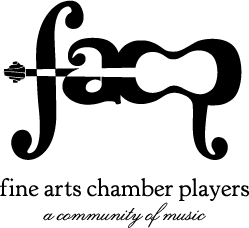 Fine Arts Chamber Players has launched a new logo, marking the most significant change in its visual identity since its formation in 1981. The updated design is bold, modern, and eye-catching. Most importantly, the FACP mission and programs are not changing. FACP continues to provide free, professional, classical music concerts, and free music education programs. Looking at the new logo, musical influences are clear: the “F” is a forte notation and resembles a string instrument’s f-hole, a quarter note is nestled in the negative space of the “A,” the “C” and “P” meld to form a stringed instrument, and the tail of the “P” completes the “f-hole” structure. FACP worked with Celeste Rader-Philips at Rader-Philips Design on the new logo. 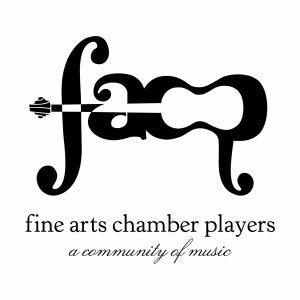 Members of the media, arts organizations, and community partners should contact Communications Manager Emily Guthrie at music@fineartschamberplayers.org for an image file of the logo.